The Avid Reader: The Gun Also Rises by Sherry Harris: Review and a Giveaway! The Gun Also Rises by Sherry Harris: Review and a Giveaway! 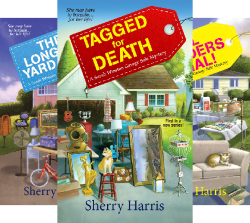 Agatha Award-nominated author, Sherry Harris, started bargain hunting in second grade at her best friend’s yard sale. She honed her bartering skills as she moved around the country while her husband served in the Air Force. Sherry uses her love of garage sales, her life as a military spouse, and her time living in Massachusetts as inspiration for the Sarah Winston Garage Sale series. 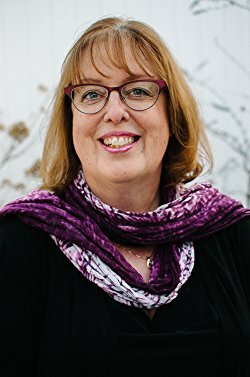 You can connect with the author on her Webpage, Facebook, Twitter, Goodreads, and Pinterest. The Gun Also Rises by Sherry Harris has us spending July in Ellington, Massachusetts. Sarah Winston is hired by Mrs. Belle Winthrop Granville III to sort through her mystery collection for a garage sale with the proceeds to benefit the Ellington Free Library. While digging through the large assortment of books that are stored in the attic, Sarah uncovers a traveling case filled with Ernest Hemingway manuscripts that disappeared from a train in Paris in 1922. Sarah takes the case down to Miss Belle who is just as surprised as Sarah at the unexpected find and asks for time alone. Soon Sarah hears Miss Belle cry out and Sarah rushes to her aid. Miss Belle was assaulted by her maid who stole the case with the manuscripts. Sarah rushes after Kay Kimble, the maid and finds her dead on a path in the woods from a bullet wound. A shot rings out and Sarah ducks to avoid being hit. Word gets out about the Hemingway papers and members of the League of Literary Treasure Hunters have descended on the town. Then a masked gunman appears at Miss Belle’s demanding the limited edition of The Sun Also Rises by Ernest Hemingway. They thwart the masked bandit and start a search for the elusive novel. Sarah must evade the literary treasure hunters while seeking clues that will lead her to Kay’s killer and the missing manuscripts. To top it off, Sarah’s reporter brother returns to town and she is busy preparing for a sale to raise funds to help a veteran reunite with his dog from Iraq. Can Sarah stay alive long enough to see another sunrise? The Gun Also Rises is a busy novel. Sarah has a full plate as she deals with missing manuscripts, her brother, a murder, preparing for a very special sale to help a veteran bring his dog to America, pricing Miss Belle’s mystery collection, evading the literary treasure hunters, hunting down the rare Hemingway book and trying not to be the killer’s next victim. The Gun Also Rises can be read as a standalone if you have not read any of the previous A Sarah Winston Garage Sale Mysteries. I find Sarah’s garage sale business interesting. She never knows what treasures she will find. I wanted to buy all the books in Miss Belle’s fictional attic. I found The Gun Also Rises to be easy to read with steady pacing throughout most of the book (a little slow in the middle). I loved all the mystery novels mentioned throughout the book (Trixie Belden and Agatha Christie are just two examples) as well as the details on Louisa May Alcott and historical sites that people can visit. There are also some clever Gone with the Wind references. The murder of Kay and the missing manuscripts leads readers on a merry chase as we follow the clues to figure out who is behind these appalling deeds. I do wish it had been harder to identify the guilty parties, and I was unsatisfied with the ending (spoilers). I was glad to see a move forward in Seth and Sarah’s romantic life. Sarah’s ex-husband has left town (finally) and Sarah can finally move forward romantically with her life. I appreciated the author highlighting the role of military spouses and the support they need when their significant other is serving overseas. There is also a storyline about a veteran suffering from PTSD who is missing the dog he had in Iraq. Sara is organizing a sale to help unite the man with his beloved canine. Readers will find themselves laughing at Sarah’s various escapades. Buckle your seatbelt for a humorous and fast paced romp with Sarah in The Gun Also Rises. 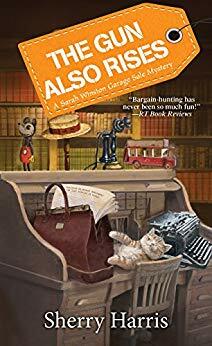 For a complete list of the books in A Sarah Winston Garage Sale Mystery series, click here. The Gun Also Rises comes out on January 29 and is available at Amazon, B&N, Kobo, Google Play , and IndieBound. The next book in A Sarah Winston Garage Sale Mystery series is Let's Fake a Deal which releases on July 30. In honor of the tour, there is a giveaway of three print copies of The Gun Also Rises. You can enter via the Rafflecopter form below or click here. Good Luck! 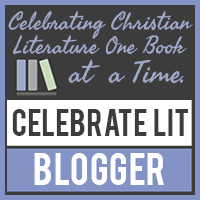 If you have an opportunity, visit the other stops on the tour for guest posts, character interviews, spotlights, reviews and author interviews. Thank you so much for joining me today. 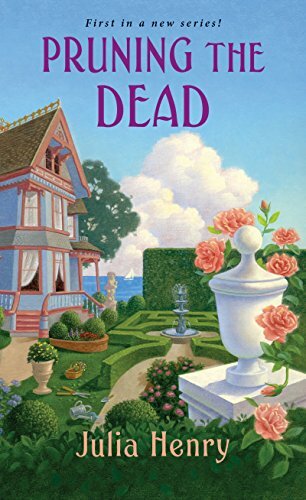 I hope you can visit tomorrow when I return to share my review of Pruning the Dead by Julia Henry. Take care and Happy Reading! Thank you for your review on "The Gun Also Rises" by Sherry Harris and for being part of the book tour. Sounds like a fabulous book and one that I would greatly love having the opportunity to read. LOVE the cover!